If you do payroll in QuickBooks 2015, or if you track sales by employees, you need to describe each employee. Describing employees is pretty darn easy. Choose the Employees→Employee Center command to display the Employee Center window. Then click the New Employee button that appears just above the list in the upper-left corner of the screen to have QuickBooks display the New Employee window. The New Employee window is pretty straightforward, right? You just fill in the fields to describe the employee. There’s no need to provide you with step-by-step instructions for this part. All you do is click a text box and type the obvious bit of information. Right? When you release an employee, it’s important to enter the release date for the employee on the Employment Info tab after you write that final paycheck. (To change to a new tab, click the tab’s name. For example, click Employment Info to display the Employment Info tab.) This way, when you process payroll in the future, you can’t accidentally pay the former employee. As for the Type field option on the Employment Info tab, most employees probably fit the regular category. If you’re uncertain whether an employee fits the guidelines for corporate officer, statutory employee, or owner, see the Circular E publication from the IRS. And sleep tight. The Address & Contact tab provides boxes for you to collect and store address information. The Additional Info tab enables you to create customizable fields in case you want to keep information that isn’t covered by the QuickBooks default fields — favorite color and that type of thing. Again, what you need to do on this tab is fairly straightforward. 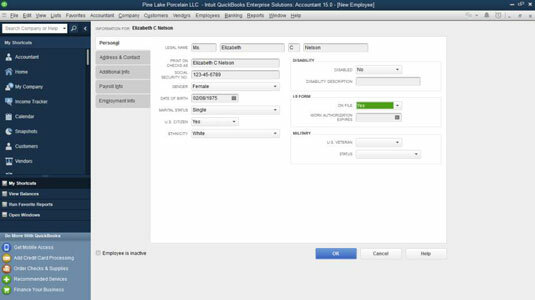 By the way, if you told QuickBooks that you want to do payroll, QuickBooks prompts you to enter the information it needs to calculate things like federal and state income taxes, payroll taxes, and vacation pay using boxes and buttons that appear on the Payroll Info and Worker’s Comp tabs. After you finish describing an employee, click OK to add the employee to the list and return to the Employee List window, or click Next to add the employee to the list and add more employees. You can also inactivate an employee from your list if it starts to get cluttered with names of employees who no longer work for you. You should wait to inactivate items until after the year is finished and the W-2 forms have been printed.